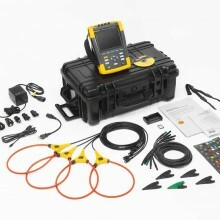 Includes: Fluke 438-II, test Lead set, 4 x i430 Thin Flexi Current Probes, Battery, Power Adapter, Soft Carry Case, CD Rom with PowerLog 430-II Software and User Documentation. 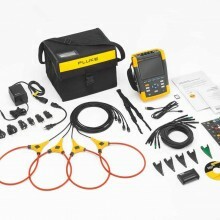 The Fluke 438-II Power Quality and Motor Analyser uses innovative algorithms to analyse not only three-phase power quality but also torque, efficiency, and speed to determine system performance and detect overloaded conditions, eliminating the need for motor load sensors. 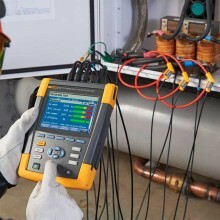 The Fluke 438-II adds key mechanical measurement capabilities for electric motors to the advanced power quality analysis functions of the Fluke 430 Series II Power Quality Analyzers. 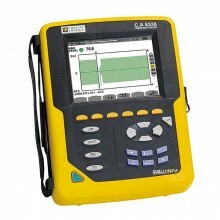 Quickly and easily measure and analyse key electrical and mechanical performance parameters such as power, harmonics, unbalance, motor speed, torque and mechanical power without the need of mechanical sensors. 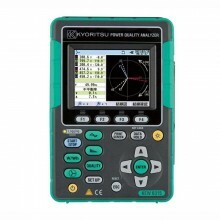 Measure key parameters on direct-on-line motors including torque, RPM, mechanical power and motor efficiency. Perform dynamic motor analysis by plotting of motor derating factor against load. 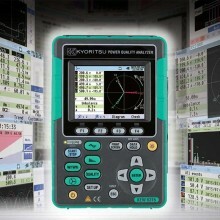 Calculate mechanical power and efficiency without the need of mechanical sensors. 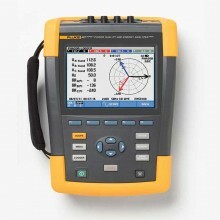 Measure electrical power parameters such as voltage, current, power, apparent power, power factor, harmonic distortion and unbalance. Identify power quality issues such as dips, swells, transients, harmonics and unbalance. PowerWave data technology captures fast RMS data, and shows half-cycle averages and waveforms. 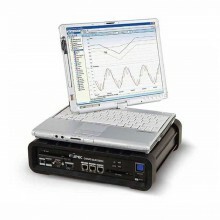 Waveform capture function captures 100/120 cycles (50/60 Hz) of each event detected event, in all modes, without set-up. Automatic transient mode captures waveform data at 200 kS/s on all phases simultaneously up to 6 kV. 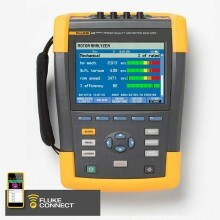 Fluke Connect® compatible* – view data locally on the instrument, via Fluke Connect mobile app and PowerLog 430-II desktop software. Safety rated for industrial applications 600 V CAT IV/1000 V CAT III rated for use at the service entrance and downstream. Calculates the amount of rotational force (displayed in lb.ft or Nm) developed by a motor and transmitted to a driven mechanical load. The motor torque is the single most critical variable that characterizes the instantaneous mechanical performance of rotating equipment driven by electric motors. Provides the instantaneous motor shaft rotational speed. Combined with the motor torque, motor speed provides a snapshot of the mechanical performance of rotating equipment driven by electric motors. Measures the actual mechanical power (displayed in hp or kW) produced by motors and provides a direct link to overloading conditions without simply basing it on the motor current. Shows the effectiveness of each motor within a machine, assembly line, plant, and/or facility in converting electric power to useful mechanical work. By properly aggregating the efficiencies of a population of motors the total (aggregate) efficiency can be estimated. Comparisons to expected motor efficiencies at observed operating conditions can help quantify the cost associated with motor energy inefficiency. 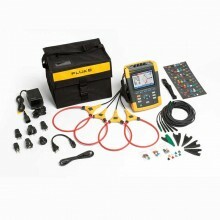 The Fluke 438-II provides a complete breakdown of electrical parameters. Prior to beginning motor analysis, it's recommended to make base line power quality measurements to assess the state of harmonics and unbalance on the electrical service output as these two properties can have a serious negative impact, on motor performance. When in Motor Analysis mode, results are summarized for electrical performance, mechanical performance and derating (according to NEMA recommendations). The easy to understand four-level color severity scale indicates motor performance in relation to the recommended electrical parameter levels including rated power, power factor, unbalance and harmonics. 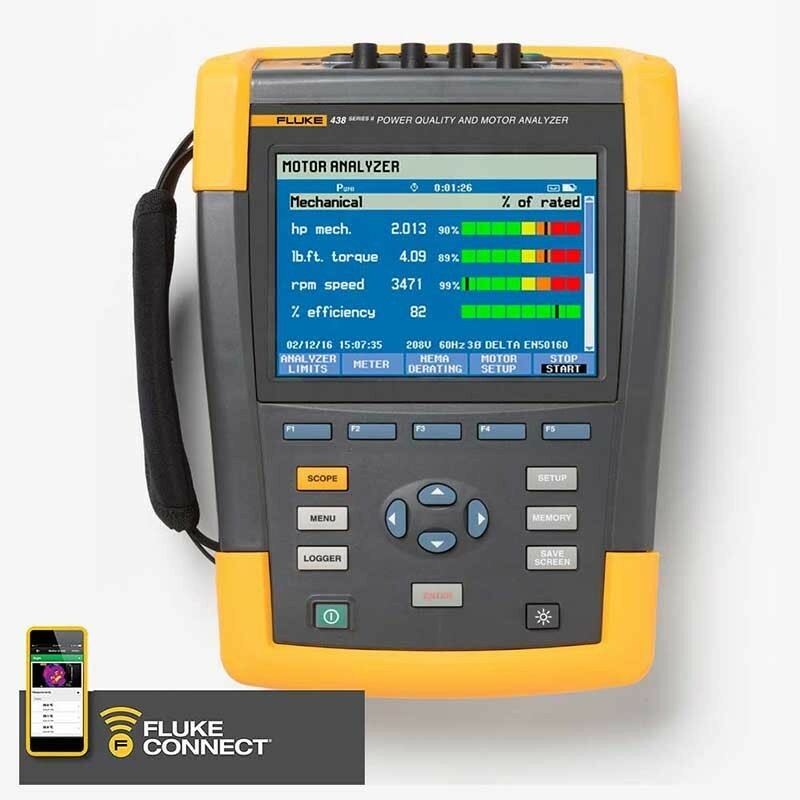 Fluke 434-II, 435-II and 437-II users can add these great motor analysis capabilities and features to their existing analysers today with a product upgrade option. Motor Type 3 phase asynchronous (induction). Power Source Variable Frequency Drive. 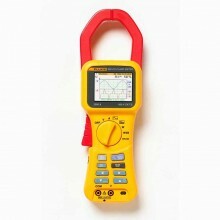 Motor Frequency Range 40Hz to 70Hz. Over/Under Voltage from Nominal V/f Curve (%) -15% to +15%. Frequency 40 to 70 Hz. 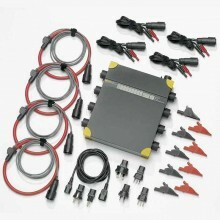 Inverter Type CSI (current source inverter). Motors type Synchronous (DC, stepper, permanent magnet etc.). Motor Frequency <40 and >70 Hz. Vpk 1 Vpk to 1400 Vpk 1 V 5% of nominal voltage. Voltage Crest Factor (CF) 1.0 > 2.8 0.01 ±5%. Vrms½ 0.1 V ±0.2% of nominal voltage. Vfund 0.1 V ±0.1% of nominal voltage. 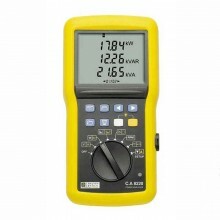 Amps (AC + DC) i430-Flex 1x 5 A to 6000 A 1 A ±0.5% ±5 counts. 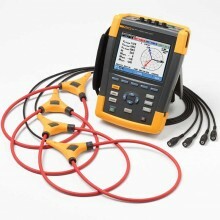 i430-Flex 10x 0.5 A to 600 A 0.1 A ±0.5% ±5 counts. 1mV/A 1x 5 A to 2000 A 1A ±0.5% ±5 counts. 1mV/A 10x 0.5 A A to 200 A (AC only) 0.1 A ±0.5% ±5 counts. Apk i430-Flex 8400 Apk 1 Arms ±5%. 1mV/A 5500 Apk 1 Arms ±5%. A Crest Factor (CF) 1 to 10 0.01 ±5%. 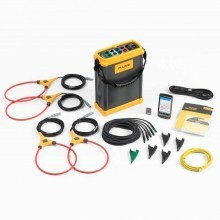 Amps½ i430-Flex 1x 5 A to 6000 A 1 A ±1% ±10 counts. 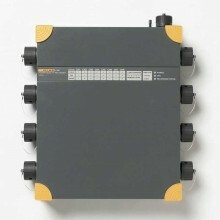 i430-Flex 10x 0.5 A to 600 A 0.1 A ±1% ±10 counts. 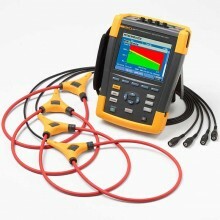 1mV/A 1x 5 A to 2000 A 1 A ±1% ±10 counts. 1mV/A 10x 0.5 A A to 200 A (AC only) 0.1 A ±1% ±10 counts. 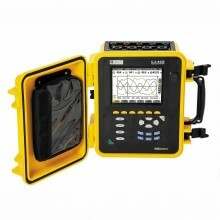 Afund i430-Flex 1x 5 A to 6000 A 1 A ±0.5% ±5 counts. 1mV/A 1x 5 A to 2000 A 1 A ±0.5% ±5 counts. 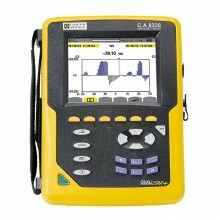 Fluke 434 @ 50 Hz Nominal 42.50 Hz to 57.50 Hz 0.01 Hz ±0.01 Hz. 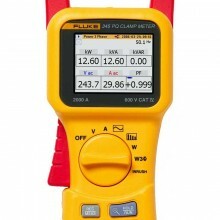 Fluke 434 @ 60 Hz Nominal 51.00 Hz to 69.00 Hz 0.01 Hz ±0.01 Hz. Watts (VA, var) i430-Flex max 6000 MW 0.1 W to 1 MW ±1% ±10 counts. 1 mV/A max 2000 MW 0.1 W to 1 MW ±1% ±10 counts. 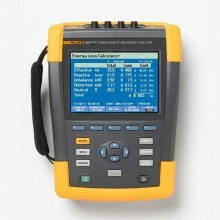 Power Factor (Cos j/DPF) 0 to 1 0.001 ±0.1% @ nominal load conditions. kWh (kVAh, kvarh) i430-Flex 10x Depends on clamp scaling and V nominal ±1% ±10 counts. Energy Loss i430-Flex 10x Depends on clamp scaling and V nominal ±1% ±10 counts Excluding line resistance accuracy. Harmonic Order (n) DC, 1 to 50 Grouping: Harmonic groups according to IEC 61000-4-7. Inter-Harmonic Order (n) OFF, 1 to 50 Grouping: Harmonic and Interharmonic subgroups according to IEC 61000-4-7. Volts % f 0.0% to 100% 0.1% ±0.1% ±n x 0.1%. r 0.0% to 100% 0.1% ±0.1% ±n x 0.4%. THD 0.0% to 100% 0.1% ±2.5%. Amps % f 0.0% to 100% 0.1% ±0.1% ±n x 0.1%. Absolute 0.0 to 600 A 0.1 A ±5% ±5 counts. Watts % f or r 0.0% to 100% 0.1% ±n x 2%. Absolute Depends on clamp scaling and V nominal — ±5% ±n x 2% ±10 counts. THD 0.0% to 100% 0.1% ±5%. Phase Angle -360° to +0° 1° ±n x 1°. Plt, Pst, Pst (1 min) Pinst 0.00 to 20.00 0.01 ±5%. Volts % 0.0% to 20.0% 0.1% ±0.1%. Amps % 0.0% to 20.0% 0.1% ±1%. Relative V % 0% to 100% 0.10% ±0.4%. Absolute V3s (3 second avg.) 0.0 V to 1000 V 0.1 V ±5% of nominal voltage. 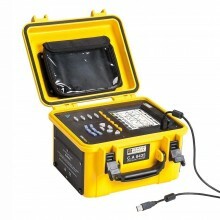 Case Design Rugged, shock proof with integrated protective holster Drip and dust proof IP51 according to IEC60529 when used in tilt stand position Shock and vibration Shock 30 g, vibration: 3 g sinusoid, random 0.03 g 2 /Hz according to MIL-PRF-28800F Class 2. 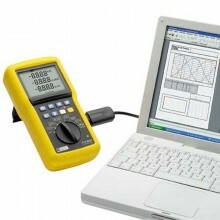 Display Brightness: 200 cd/m 2 typ. using power adapter, 90 cd/m 2 typical using battery power Size: 127 x 88 mm (153 mm/6.0 in diagonal) LCD Resolution: 320 x 240 pixels Contrast and brightness: user-adjustable, temperature compensated. Memory 8GB SD card (SDHC compliant, FAT32 formatted) standard, upto 32 GB optionally Screen save and multiple data memories for storing data including recordings (dependent on memory size). Real-Time Clock Time and date stamp for Trend mode, Transient display, System Monitor and event capture. Operating Temperature 0°C ~ +40°C; +40°C ~ +50°C excl. battery. Storage Temperature -20°C ~ +60°C. +40°C ~ +50°C: 45% RH non-condensing. Maximum storage altitude 12 km (40,000 ft). Electro-Magnetic-Compatibility (EMC) EN 61326 (2005-12) for emission and immunity. 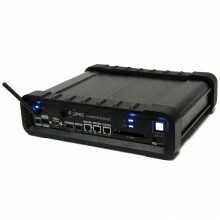 Interfaces Mini-USB-B, Isolated USB port for PC connectivity SD card slot accessible behind instrument battery. 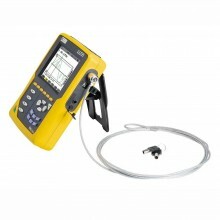 Fluke 438-ll warranty Three years (parts and labor) on main instrument, one year on accessories. 4. 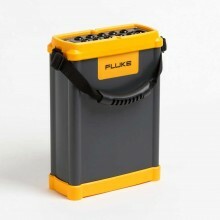 For nominal voltage 50 V to 500 V.
PDF Specifications of the Fluke 438-ll Motor & Power Quality Analyser.